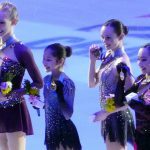 DETROIT, MI–Alysa Liu’s head barely reached the microphone on the table in front of her as she fielded questions from the media after becoming the youngest skater ever to win the ladies event at the U.S. Figure Skating Championships on Jan 25 in Detroit. The 13-year-old had just made history by landing two triple axels—one in combination with a double toe loop—in her free skate. She’d also landed one in the short program a day earlier. Liu is the first American woman to land three triple axels in a competition. But she is also a middle schooler who said she likes to ride her bike and play tag with her siblings in her hometown of Oakland, California. Too young to go to the World Championships, too young even for this year’s World Junior Championships. Liu sees this as a positive. “I’m not too worried about that part, because I get more time to work on my jumps, skating skills, [and] spins,” she said. 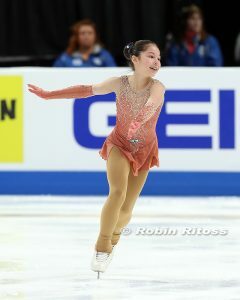 In her senior debut, Liu put on quite the display of jumps, skating skills, and spins, earning 217.51 points en route to the title. “I was really happy with the score. I was just happy I beat my personal record and did a clean long program,” Liu said. Defending U.S. champion Bradie Tennell struggled on her usually rock-solid jumps in the free skate, stepping out of the second half of her opening triple lutz-triple loop combination and falling on a second triple lutz later in the program. The 2.71-point lead that she had after a commanding short program—which set a new U.S. Championships record of 76.60 points—wasn’t enough to hold off Liu. “Obviously, it wasn’t my best skate. And I’m disappointed, but there is always something to be learned from skates like this, so I’m excited to get back home and work harder than ever to fix what I made mistakes on,” Tennell said. 2017 U.S. bronze medalist Mariah Bell skated a nearly-clean program, but for a fall on a triple lutz that was supposed to be a triple lutz-double toe-double loop combination. She rallied after the fall for a clean triple flip, and then tacked on the double toe-double loop to her final lutz late in the program. Bell was a close second to Liu in the free skate, only 1.52 points behind. She led the field in program components in the free skate, with 69.99 points. Hanna Harrell earned the pewter medal in her senior debut. 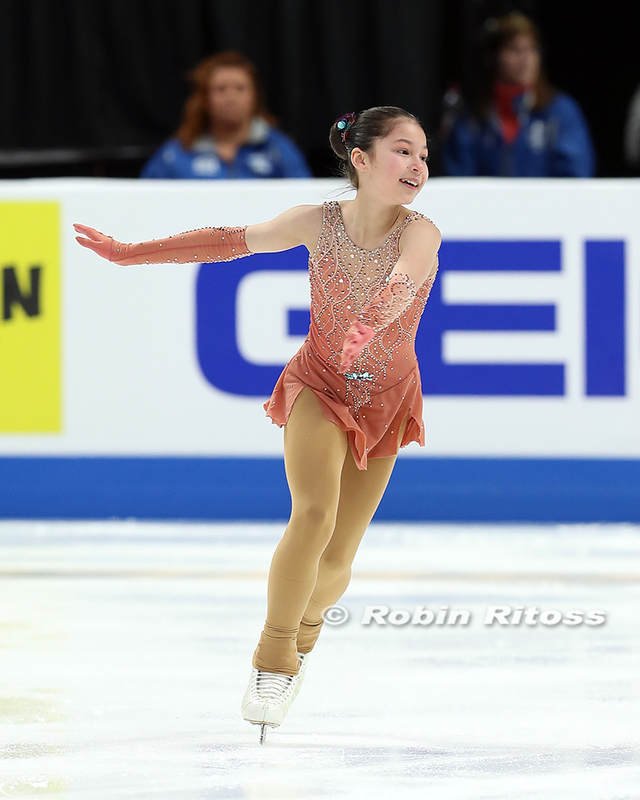 The 15-year-old from Plano, Texas, landed a triple lutz-triple toe loop combination that earned positive GOE in both segments of the competition. While the night may have belonged to Liu, fifth place finisher Ting Cui also won the hearts of the Detroit crowd. She earned the only other standing ovation of the night with a seven-triple performance, including a triple lutz-triple toe and a slightly underrotated triple flip-euler-triple salchow. It was a redemptive performance after she fell twice and failed to complete a combination in the short program, landing in 12th place.